A deep dive into DC Comics' Ragman with Ray Fawkes and Inaki Miranda – AiPT! 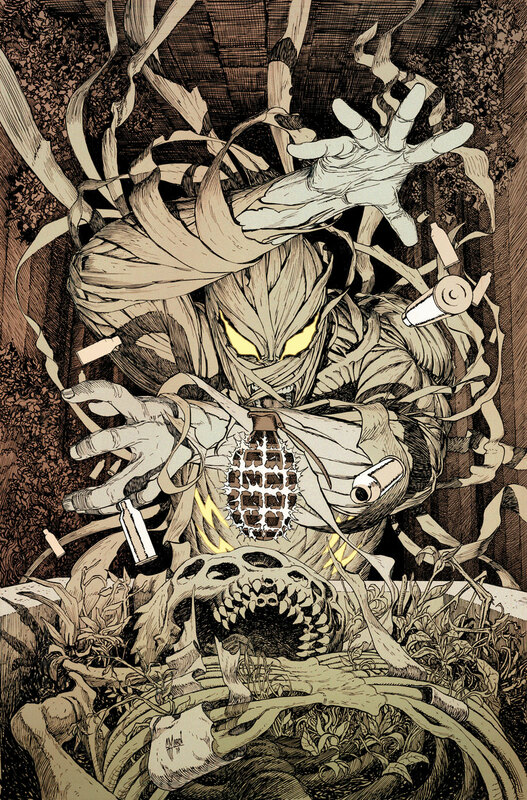 Ray Fawkes and Inaki Miranda discuss the recently released Ragman #1. We spoke to Ray Fawkes and Inaki Miranda last month about Ragman a Rebirth introduction of the Ragman character. We learned it’s going to be a supernatural hero character that Miranda wished would one day end up on the Justice League. Ragman #1 is out this week, so we pinged the creative duo to talk shop on the first issue after its release, especially now that it’s fresh on our minds. AiPT! : Ragman appears to be dealing with some issues in regards to mental illness and maybe PTSD. How much research did you do in preparation for Ragman? Ray: I did a significant amount of reading and watching testimonials by soldiers and emergency responders suffering from PTSD, since Rory’s trauma and the way he deals with it is the hub that forms the center of this story, I really needed to make sure I knew what I was talking about. Some of the direction that I gave in the script – Rory’s posture when he isn’t in his Ragman guise, for instance, and the way he talks – is very much directly informed by that research. Inaki Miranda: My part was more focused in trying to show his mental state through his eyes and the way he would walk or sit. AiPT! : Once Ragman appears I got a distinct Spawn or Venom-like feel from the character. Was this on purpose, and might we expect an anti-hero angle as the story progresses? Ray: How can I put this without spoiling the story? Hmm. Let’s say this: Rory doesn’t want to be an anti-hero. He wants to be a hero. But the rags… they might have different ideas. Inaki: Yes, I drew inspiration from all of the corners of my pop culture fan life: Batman, Spawn, The Darkness, Soul Reaver, and if you look close enough there’s also a Spider-man and Ultraman influence in this new Ragman, visually speaking I mean. AiPT! : Inaki, the design of the new Ragman is less stitches and more long winding bandages. What made you go with this new look? Inaki: I honestly didn’t know much about Ragman before being offered the book, so apart from the obvious research I did, my first exposure to the character was through Ray’s premise. And I also have to admit the original multicolor patchwork look wasn’t that much appealing to me, at least not with this new 21st century direction we were taking. The rag of souls has its own life, so that was something that we felt we had to show in an evident way and, the long bandages, the way they behave, I thought they were perfect for the character’s new look. You have to think that they are not made out of fabric, they can be as rough as sand paper or hard as steel. It’s dangerous to even touch it! And it was also important that they wouldn’t just wrap around Rory like in a mummy, so I designed them to embrace him as an exo-skeleton, with the rags placing themselves and moving as muscles around him. Its like a tactical armor. This also allowed us to play around with Ragman’s powers and abilities a lot more. Readers will be able to see throughout the issues just a hint of what this new Ragman can do, and how moldable this new suit of souls really is. AiPT! : The supernatural angle of the series seems to run deep. Is the Ragman mythos his own, or does it tie into other DC stories or characters we’ve seen before? Ray: Ragman is part of the DC world – his supernatural abilities, as you’ll see, draw from a well that ties directly to other DC characters, and some of them are going to come calling very soon. No man is an island – especially not when they wear a very powerful magic item wrapped around their body. AiPT! : The first issue is focused very much on Ragman and his origin, which is great, and I’m curious if we’ll get to see him rub shoulders with any familiar DC heroes or villains in the future? Ray: You will indeed. Starting with issue 2, actually. Hmm. Who should I spoil? I can spoil at least one of them, I’m sure. Maybe if I don’t say their name out loud. OK: fans of Demon Knights will likely enjoy this book. AiPT! : Israel is the location of, presumably, Ragman’s powers and I’m curious, will there be a religious element to this series? Ray: Israel itself isn’t really the source of Ragman’s powers – they come from somewhere else. The religious elements in this story are there if you look for them, but they don’t take front and center position. AiPT! : October seems like the perfect time for Ragman to hit store shelves though its 6 issues. Will readers get the same horror-like vibes all the way through and will there be an issue set during Christmas? Ray: They will get the horror vibes all the way through, yeah. Ultimately, Ragman’s story is about selfless heroism in a world of trauma and horror. But you won’t get a Christmas issue this time around. Rory’s Jewish!